The Sustainable Groundwater Management Act (SGMA), passed in 2014, is changing the way California manages its groundwater resources. SGMA calls for the creation of local Groundwater Sustainability Agencies (GSAs) and tasks them with developing and implementing Groundwater Sustainability Plans (GSPs) to achieve sustainable groundwater management. SGMA offers GSAs a broad palette of tools to choose from and significant flexibility to tailor their management activities to local conditions and needs. Because it allows GSAs to assign groundwater extraction allocations to pumpers and to authorize transfers of these allocations under certain circumstances, SGMA potentially opens the door for the development of local groundwater markets. In such a market, a willing seller might trade a portion of their groundwater extraction allocation to a willing buyer, allowing the buyer to pump groundwater in the seller’s stead. In concept, markets can be used as tools to efficiently achieve specific management objectives. For example, in some areas, local groundwater markets could potentially further sustainable management under SGMA. However, this will not be the case in every groundwater basin. Used inappropriately, groundwater markets could have unintended consequences, including harmful social and environmental impacts. Where GSAs decide to employ local groundwater markets, careful design and implementation will be critical to ensuring their success. The stakes involved in SGMA implementation are high. Groundwater is a common-pool resource: extractions by one user in one place affect the resource at large and, therefore, the ability of others to use the resource. Changing where or when groundwater is pumped or the place, method, timing, or purpose of its use can change the impacts experienced by people and ecosystems. Groundwater management decisions made today will affect everyone in a basin, now and well into the future. The full impacts of poor decisions may not be felt until long after they are made, and some impacts may be irreversible. 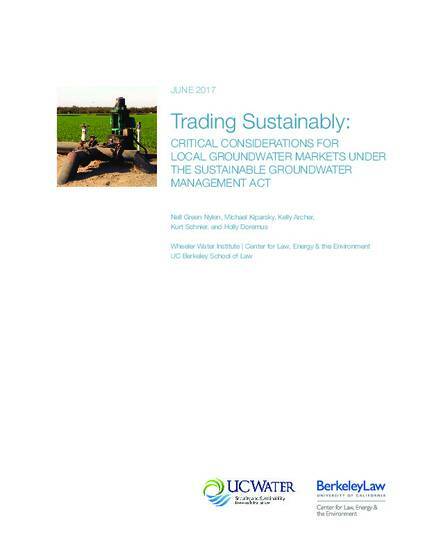 Therefore, this report outlines a set of considerations GSAs will need to examine when evaluating whether a local groundwater market might be a viable tool for furthering sustainable management in a particular groundwater basin, and, if so, how to effectively implement it.